Osteoarthritis is a painfully common condition, but hard to treat effectively and to diagnose early. It occurs when the cartilage that coats the ends of bones and joints wears away over time, leading to immobility and pain. Pain killers can help, but the only truly effective treatment is through surgery to replace cartilage or to implant replacement joints. Diagnosis of osteoarthritis depends on x-ray imaging to detect narrowing of space between the bones in the joint. But this effect can be gradual and subtle and difficult to spot, depending on the judgement and experience of the clinician. Lack of sensitivity of x-rays can also make it difficult to detect changes in the joint over time. 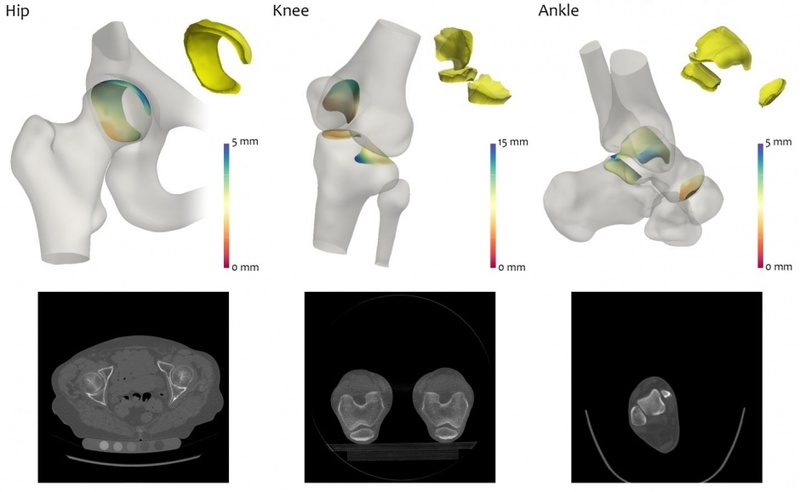 In a paper in the journal Scientific Reports, Turmezei and colleagues explain how they have turned to computerised tomography (CT) scanning to identify changes in the space between bones in the joints. CT scanning is an established technique, commonly used to look at internal organs and (with the help of contrast agents) blood flow, but it is not normally used to monitor joints. However, with its ability to construct detailed three-dimensional images from “slices” through the body, Turmezei believes it could be a powerful tool. The Cambridge team has developed a technique called joint space mapping (JSM). The initial research was carried out on human hip joints from bodies donated to medical research. This revealed that the technique was more sensitive than the current “gold standard” for joint imaging with x-rays, proving at least twice as good at detecting small structural changes. The researchers have refined the technique using colour-coded images to illustrate the width or narrowness of the space between the bones across the whole joint. Delighted to read about this: as being nearly 10 years over design life (three score and ten) my ‘bearings’ are certainly sounding quite pitted! and wearing more and more! When it is time for replacement, I sincerely hope that in the operating team (yes have a surgeon for the messy parts) will be a good time-served tool-maker who knows what a tolerance and a proper ‘fit’ is. My son, who did his PhD at Durham with Professor Tony Unsworth, the guru of tribology in vivo, attended many installations of hip and knees he had designed. Seeing a surgeon take a hammer to the beautifully machined surfaces his work had defined (to make sure that they didn’t come out of the bone!) did not encourage him!